Note: At this time, Mobile Device Management through Mobile Iron is available ONLY for iOS and Android. In order to improve security, Coresystems has implemented Mobile Device Management for Field Service mobile on Android and iOS. This enables accounts to be associated with devices, ensuring that users can not use personal and/or unauthorized devices to access the account. 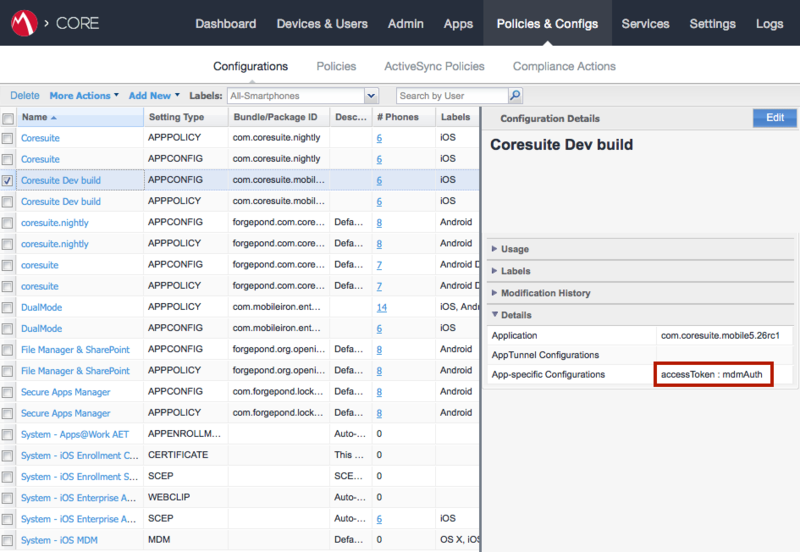 Since the iOS application uses the MobileIron SDK, there are no separate builds. Therefore, the Apple AppStore build works with and without MobileIron. After Mobile Iron has been installed, it can then be configured from the Mobile Iron CORE admin portal. For setup and configuration of the application access your Mobile Iron CORE admin portal and login using the admin credentials. Note: Please contact Coresystems for support for assistance in creating Account. 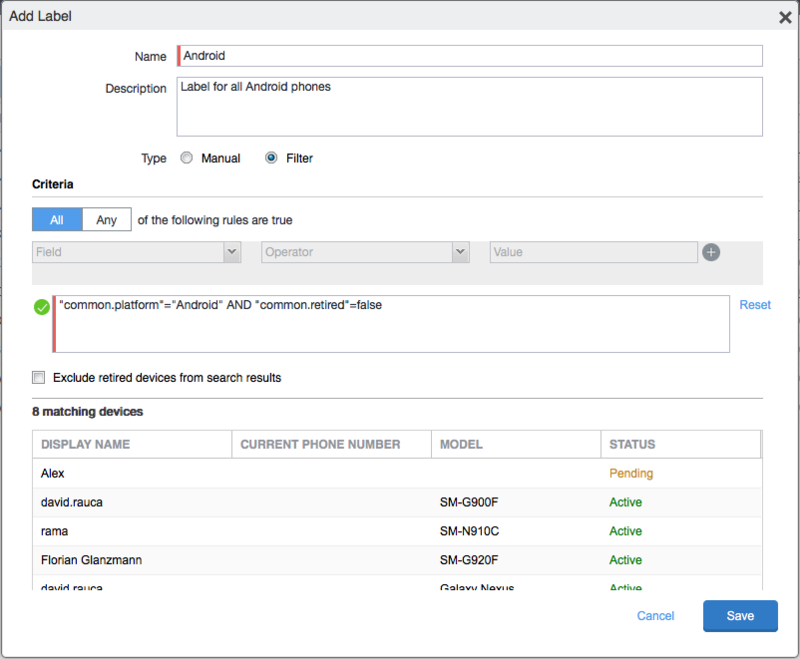 In order to be able to access the Mobile@Work app, a user needs an account on MobileIron platform that should be created by the Admin. The Admin can create a user account using the following steps and the screenshot below. Fill in the form and Click the "Save" button. As stated above, the iOS application uses the MobileIron SDK, therefore we can use the application uploaded to the Apple App Store directly. Because of this, there is no need for an Mobile Iron-only version of the product. 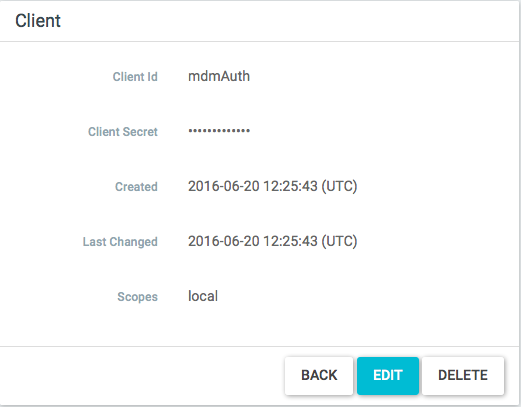 Access admin application https://apps.coresystems.net using admin credentials. 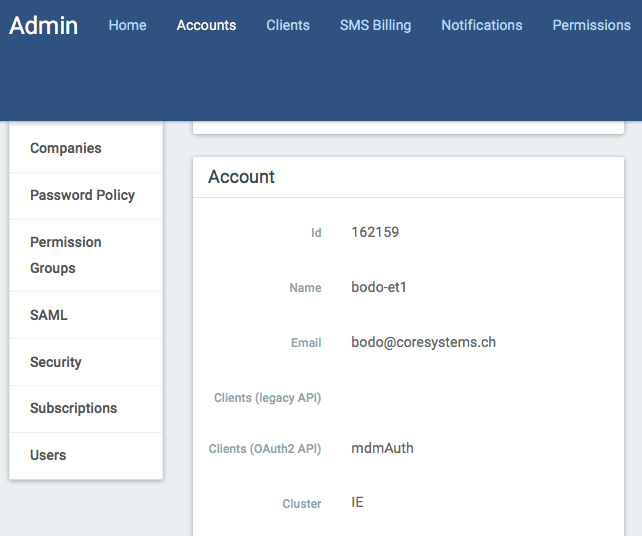 Go to https://apps.coresystems.net/admin/clients and add a Client using the Create button, for example we added one with Client Id mdmAuth, Client Secret has to be exactly as the Client ID. Search and select your coresuite account. Choose to edit account and select an option for Clients (OAuth2 API) property. This will be your authentication token which needs to be configured in Mobile Iron as well. 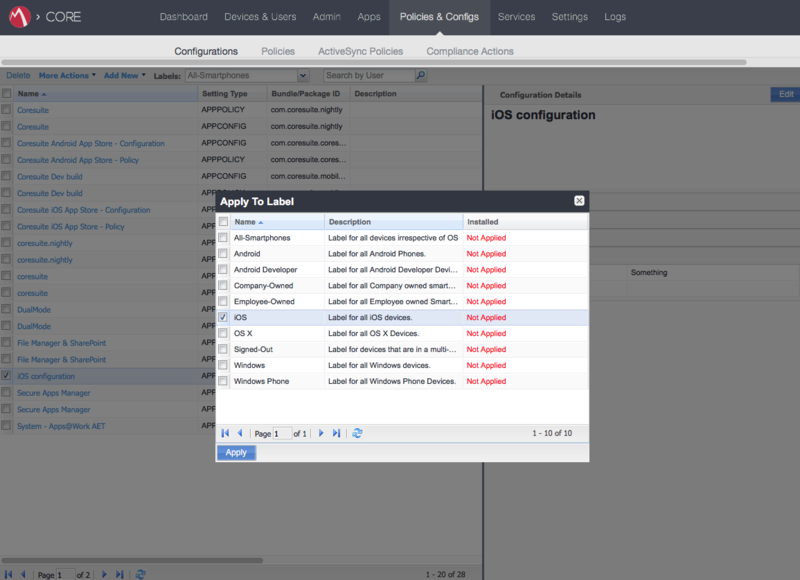 Go to Mobile Iron CORE admin portal (https://de.mobileiron.net/coresystems/login.jsp?logout=1) > Policies & Configs, select Coresuite for iOS option from the list. Click Edit on the right side panel and edit the access token to be the same as the one from step 4. IMPORTANT: For "Application", use the identifier listed at the start of the document. Select the config created for the app (the CORE will create one by default). Configs have the Setting Type "APPCONFIG". Click the Edit button (from top-left corner). Scroll down to App-Specific Configurations and Click the "Add" button. 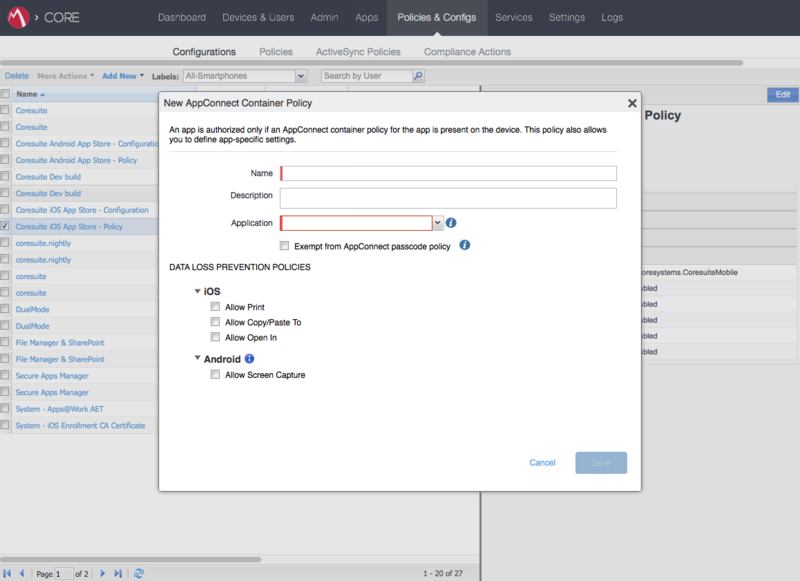 Navigate to Add New > AppConnect > Container Policy. In the Application field enter the identifier noted at the begining of this document. Labels are generally created by default by Mobile Iron, so if you already have an iOS label, this step is not required. Note: The steps for creating a label are the same as the ones from the Android documentation. Use iOS in the “common.platform” field, instead of Android, and name it accordingly (i.e. iOS). 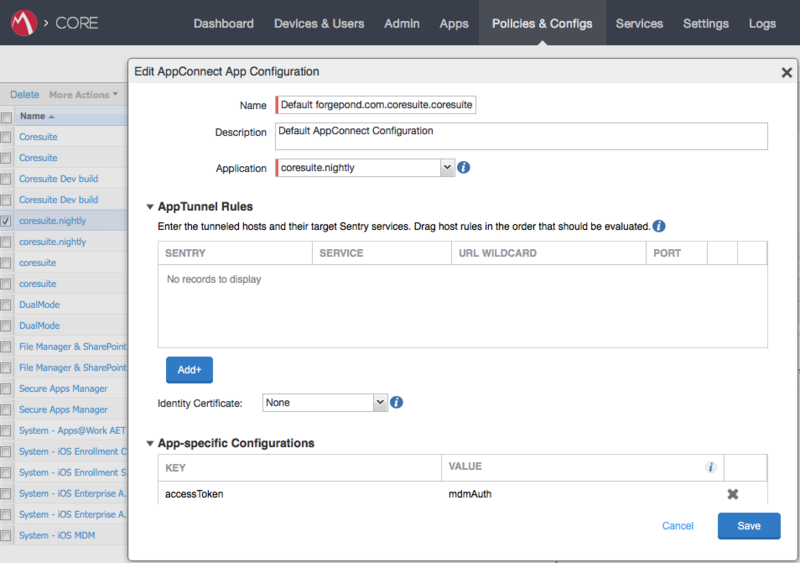 Adding the AppConfig and AppPolicy to a label makes it easy to apply to devices. When a new device is added to the portal, it can be assigned to a label. Everything configured for that label is applied to it automatically. Select both the AppConfig and AppPolicy created or updated in the previous steps. Click "More Actions" and "Apply To Label"